Since we are in flu season, you are probably aware that viruses enjoy taking over our lives, but not all viruses cause disease. In fact, there are many different outcomes for a virus after it makes its way into the human body. In many cases, the immune system may be able to eliminate the problem before an infection begins. Unfortunately, sometimes that doesn’t work and then the virus may kill its host and in turn, kill itself. However, in most cases, viruses replicate within the host and then find some method of locating a new host before it is identified and destroyed by the immune system. However, one of the most interesting paths of a virus includes hiding with the DNA of its host. Scientists have discovered multiple examples of how some viruses have worked their way into the human genome. The most common viruses that act this way are called retroviruses and they have the capability not only to duplicate themselves, but also use an enzyme to force their genetic information into the host DNA. Once the retrovirus has integrated into the genome, it is effectively hidden from the immune system. When the virus is awakened, the viral information the DNA will code for viral proteins and the cell will make new viruses accordingly. While the retrovirus is in the genome, it can pass itself down through generations of cells, and sometimes lay dormant for decades. 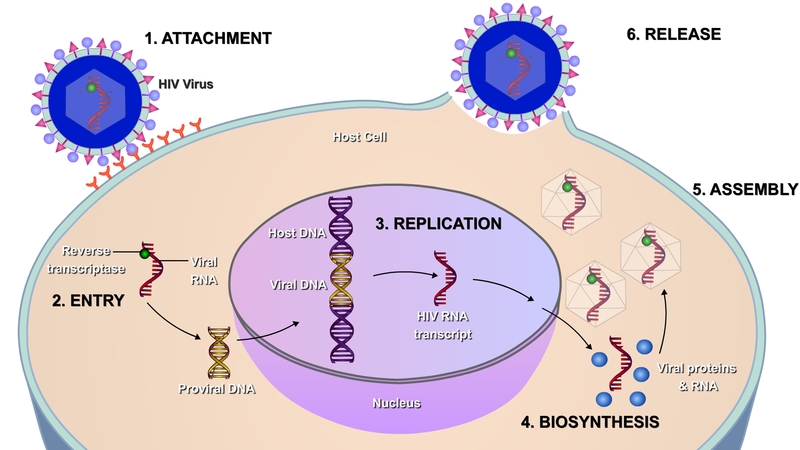 As our graphic below illustrates, HIV is one example of a retrovirus that has worked its way into the human genome. You may wonder how this information can help us? Scientists have the capability to trace the viruses that have worked their way into our genome. If researchers can see how viruses have succeeded in the past, they have a better knowledge base to work with when trying to stop them in the future! Theresa Koos is a sophomore at Clarke University in Dubuque, Iowa where she is studying to be a physical therapist with a major in biology. Interested in writing for us? – then send us a message using our contacts page.